Published research shows that cigarette smoking rates among people living with HIV/AIDS are substantially higher than those of the general public. “The prevalence of smoking adults in the United States is about 18%, but that figure increases to approximately 50% for people with HIV/AIDS,” says Damon J. Vidrine, DrPH, MS. “Furthermore, people with HIV/AIDS are at higher risk from the adverse health consequences of smoking, including heart disease, cancer, pulmonary disease, and overall mortality.” A recent study found that more than 60% of deaths among people living with HIV/AIDS can be attributed to smoking. “Smoking can also interfere with the efficacy of medications used to keep HIV/AIDS under control,” adds Ellen R. Gritz, PhD. Participants received smoking cessation treatment either through UC or were assigned to counseling that was delivered by a cell phone intervention (CPI). The CPI group received the UC components plus counseling over 3 months and access to a supportive hotline. The CPI was designed to reduce access to care barriers, provide an intensive level of support, and meet the special needs of the target population. CPI participants were provided with a prepaid cell phone, and those who provided counseling were trained and supervised by a licensed clinical psychologist. The study team designed cognitive and behavioral components to help modify thoughts and behaviors that often serve as barriers to quitting smoking and remaining abstinent. A motivational component was designed to address fluctuations in quit motivation and promote greater self-efficacy for quitting smoking during the treatment delivery phase. High levels of depressive symptoms and poor mental health status are also important to consider, according to Dr. Gritz. “There is a substantial burden of mental illness among smokers and those with HIV/AIDS,” she says. It has been well documented that people suffering from depression have lower quit rates than non-depressed people. Gritz ER, Danysh HE, Fletcher FE, et al. Long-term outcomes of a cell phone–delivered intervention for smokers living with HIV/AIDS. Clin Infect Dis. 2013;57:608-615. Available at: http://cid.oxfordjournals.org/content/57/4/608.abstract. Vidrine DJ, Marks RM, Arduino RC, Gritz ER. 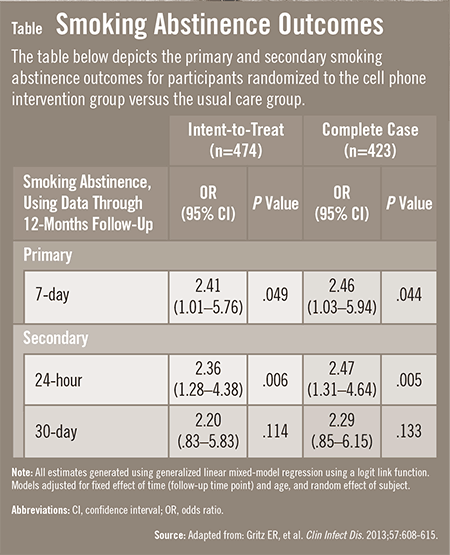 Efficacy of cell phone-delivered smoking cessation counseling for persons living with HIV/AIDS: 3-month outcomes. Nicotine Tob Res. 2012;14:106-110. Vidrine DJ, Arduino RC, Gritz ER. The effects of smoking abstinence on symptom burden and quality of life among persons living with HIV/AIDS. AIDS Patient Care STDS. 2007;21:659-666. Vidrine DJ. Cigarette smoking and HIV/AIDS: health implications, smoker characteristics and cessation strategies. AIDS Educ Prev. 2009;21(suppl):3-13. Nahvi S, Cooperman NA. Review: the need for smoking cessation among HIV-positive smokers. AIDS Educ Prev. 2009;21(suppl):14-27. Helleberg M, Afzal S, Kronborg G, et al. Mortality attributable to smoking among HIV-1-infected individuals: a nationwide, population-based cohort study. Clin Infect Dis. 2013;56:727-734. 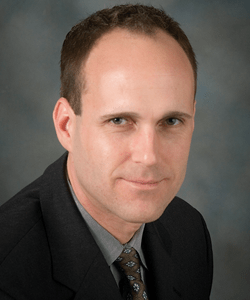 Damon J. Vidrine, DrPH, MS, has indicated to Physician’s Weekly that he has worked as a consultant for the University of Texas Health Science Center at Houston and has worked as a paid speaker for the University of North Texas Health Science Center at Fort Worth. He has also received grants/research aid from the NIH and CMS. 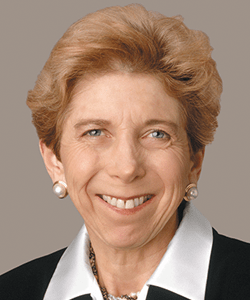 Ellen R. Gritz, PhD, has indicated to Physician’s Weekly that she has no financial interests to report.